Batman & Catwoman… creepy PDA? The breaking of the Bat continues as another chapter of Tom King’s Magnum Opus continues. 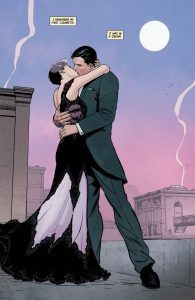 Batman #63 sees Batman living the life he hoped for, the life he dreamed of if only Catwoman had decided to attend their rooftop wedding rather than jilting Bruce at the altar. Life would have been quite different if the wedding had occurred. A happier Batman, a content Batman, and weirdly a Batman fond of a little PDA. Yet oddly even with everything going right for Batman nothing is actually what it seems, and just like with last issue confrontation with Professor Pyg, this issue only creates more questions then answers. Along for this sojourn into the dreamscape of the inner mind of Batman is DC’s favorite grifter magician John Constantine, who brings a lovely bit of snark and sarcastic whit as well as a healthy dose of honesty and reality. It’s an odd combination but one that works and makes an already great book magical. To think of what could have been? Tom King continues his masterful work on Batman. His long game is very apparent as we near the third act of his promised one hundred-issue storyline. I truly hope that there are another hundred issues to follow, as the entirety of King’s run since he took over during the DC Rebirth has been excellent and with the twice monthly shipping I see the end to be nearer then I want it to be. Joining King on this issue is the incredible Mikel Janin and these to long time collaborators (going all the way back to the under appreciated Grayson) truly know how to create an excellent comic book that plays to the strengths of each other. Jordie Bellaire’s beautiful colors amplify the already gorgeous artwork, the color palate shifting to help set the tone of the book. All in all Batman #63 is yet another incredible issue of one of the best books in publication today. Verdict: Batman #63 is another great issue from Tom King and his frequent collaborator Mikel Janin. It’s a wonderfully constructed issue that continues King’s long form story and is an absolute Buy!